TradeRewards.com Builds "Open Access Barter System"
According to founders Steve Zanazzi and Reid Nunn, their barter company offers the barter marketplace a one-of-a-kind service. Just last year, January 1999, the two decided that it was time for an "open access barter system." In layman's terms this means TradeRewards is the first barter company to encourage members of all trade exchanges to trade with one another. They aim to be the clearing center for the commercial barter industry, similar to the Visa or MasterCard services in the banking industry. TradeRewards is a multi-pronged internet service which embraces every barter sector, i.e. wholesale, retail, corporate, and individual activity. Zanazzi says one of their unique features is "opening up organized barter to individuals." The founders are now launching an aggressive partnering program, and through NetPartners Marketing Corporation (NMC) the company is conducting a Direct Public Offering of its stock. This Printer Is An Astute "Barter Profiteer!" An ambitious entrepreneur has taken a printing operation from a single broken-down press in a 600-square-foot cubbyhole, and built a business that today encompasses a 40,000-square-foot plant doing $10 million in sales and employing 61 people. He's used barter from day one and continues to do so today, but he's a little more ambitious in his efforts than the "average" trade member. Here's the story on this "barter profiteer." Although he now has nine new sheet-fed presses, he admits his biggest profits are generated from his three IBM high-speed copy machines. They offer quick turnaround and are very profitable. When asked to be more specific he explained, "I view this barter business as extra business...with paper being my only out-of-pocket cost. We purchase the paper, 20-pound stock in boxes of 5,000 sheets each, at the Price Club. It costs us around $20, normally. And we sell copies for 6? each, which is the competitive price all the quick-print shops charge around here. So we're turning $20 into $300, and that's a considerable profit!" This hustler doesn't stop here. In addition to using the trade dollars earned for many of his company's needs...legal, accounting, dental, advertising, bindery, and janitorial...he goes one step further. Our entrepreneur didn't build this business without some smarts, plus the energy to go an extra mile when it was advantageous. Given his situation it's the perfect position to "cash convert." He does so by working with a nearby restaurant...in his county there are 4,700 of them, many already bartering. He provides them with needed services which he obtains with his trade dollars. Additionally, he works with a men's store, and pays for their local advertising...with trade dollars, of course. The clothing store reimburses him with gift their certificates. Again he turns around and offers his 61 employees, and other acquaintances, the opportunity of shopping at a top-notch store on a cash discount basis. Any unused certificates are sold through his local trade exchange to members for trade dollars. Needless to say, this hustling entrepreneur enjoys the diversion his bartering efforts provide him...as well as the profits. America's technology and the U.S. dollar continue to power the world economy. Countries around the globe are selling their goods in the U.S., as our booming economy continues its unprecedented expansion. Just last week, when it was announced that the U.S. imported $29 billion more in goods and services than it exported in February, the dollar rose against the euro and yen. Why does the dollar grow in strength when normally (as in the '80s) such deficits would reduce the dollar's value? It's because today these nations selling to us take the dollars received and invest them right back into U.S. government bonds and notes, as well as in the stocks and bonds of private companies. The demand for dollar assets from around the world is phenomenal. Consider that as of January this year Japan held $323 billion worth of U.S. Treasury securities; China and Hong Kong combined held $103 billion; and the OPEC nations, which ship oil to the U.S. and other countries, held $44 billion worth of Treasury bonds and bills. The implications are powerful. Foreign investors know the value of technology and believe in it, as their economies are adopting information systems to restructure companies, trying to achieve the productivity gains that have helped the U.S. economy grow without serious inflation while creating millions of new jobs. The prospect of the future is exciting. The enormous economies worldwide will be adapting to the Information Age, often with the aid of technology supplied by U.S.-based companies. Therefore ensuring that global development and prosperity will continue its expansion. Lance Lundberg, founder of ICON International a corporate barter company (BarterNews cover story issue #46), has expanded his company's services considerably with the introduction of iSolve.com. An impressive web site, iSolve services match buyers and sellers of surplus property, excess assets, and idle capacity in addition to providing comprehensive logistics and distribution services. They also guarantee that all goods listed on the site will receive an offer within 30 days. SwapStation.com, a new internet company, has developed a web site that is dedicated to the bartering of MP3 files between subscribers. The site's catalog currently lists some 1.2 million songs, making it one of the largest lists of MP3 in the world. ITEX Corporation, a trade exchange with multiple U.S. locations, has purchased an office building in Sacramento (CA), where the corporate offices will be relocated effective June 1. James Bolin, chairman of Bid4gems.com reports that his site is the world's largest supplier of loose gemstones on the worldwide web. Company president John Leppek says the site will handle $500,000 per month in sales, and is the first cash and barter auction site on the web. 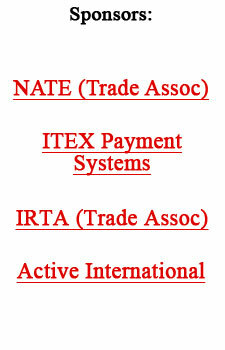 The IRTA 21st Annual International Barter Congress is scheduled for September 14-17 in Phoenix, Arizona. The location for this year's convention is the Crowne Plaza Phoenix Downtown Hotel. Corporate sponsors include "Platinum Congress Sponsor" Active International, and "Gold Sponsors" Allan R. Hackel Organization, Trade Exchange of America, and Exchangemall.com. Discounts are available for early registration. For complete details call IRTA at (312) 461-0236, or click to e-mail: IRTA .